Watching the Watchers: Strategies to Resist Police was held Saturday, January 24th in downtown Chicago. 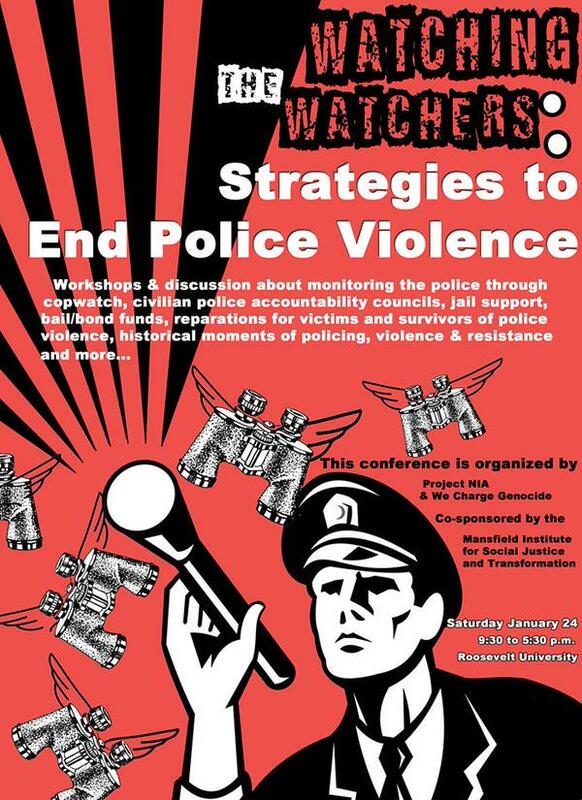 This conference built on Chicago’s long history of organizing against police torture and violence. The purpose was to further popular education and to encourage more folks to join existing efforts or launch new projects to end oppressive policing and dismantle the prison industrial complex. In attendance were long-time and emerging activists and organizers, children and youth, parents, students, teachers and educators, and community members. Some people may have arrived believing in reforms but left with wanting abolition. Some people may have arrived wondering where they belonged in the movement and left knowing that figuring it out starts with believing in it. Some people may have left with more questions than answers but know they have hundreds of other people willing to help find the answers. Either way, at this conference there were generations walking side-by-side to workshops and the healing room, where folks were able to grab snacks, hang out, and decompress. Conversations continued after sessions outside of the rooms or in the lounge. Small groups of friends, hopefully old and new, met in the open lounge area in between and during workshops. Many people could be found writing in notebooks, tweeting inspirational quotes and new knowledge, and making phone calls to friends who were missing out. This photo album shows some of the folks in attendance. Post by We Charge Genocide. This storify captures some of the dialogue and learnings that were happening during the conference. Here is the video from our keynote with Ejeris Dixon. Take a look. Read some tweets. Watch the video. It’s truly incredible. We can envision a world where love reins supreme. If we cannot envision that world, then we cannot have it. It is our duty to fight, and it is our duty to win. We have nothing to lose but our change: We are building a new world, together. It is easy to fall into the trap of measuring our personal progress, the progress of the projects we are working on, and the progress of progress itself when we are faced with so many of our peers at the same time. At this conference, I didn’t spend a moment’s thought on measurement: It was simply a joy to be surrounded with a group of people who are brave enough to dare to dream of a world where our creativity, our compassion, and our collective efforts will lead to a more peaceful and just society. It was electric. When we fully practice & embrace liberatory goals, it changes the way we meet, the way we are—inside our most private selves and outside amongst each other. When you are creating the road that doesn’t exist, you evolve on the journey together. People are giving us gifts, and we have to say what we did with those gifts. Movements are built off of many peoples’ sacrifices. Movements are built by us. The electricity that filled this conference did not come from a place of comfort, not the enjoyment of each others’ company solely—the energy that we created together came alive when we washed away that stale sense of desperation that has permeated news lately and instead bolstered a sense of matter-of-fact solidarity in a fight worth winning. Step outside the circle where we pit visionary goals versus concrete actions. Create practical steps to an aspirational vision. We need freedom and we need a way to live right now. Embrace and embody duality. At the end of the day, I felt empowered to be We Charge Genocide. For me, this conference was about embracing that name, that mission, and most of all that responsibility. I know the people that I met will hold me accountable, and I them. Together, we forge the tools to watch the watchers, to make our peaceable security a reality. In the end, practicing liberation is about a rigorous push for answers, and knowing we may not have those answers. In the end practicing liberation is about embodying a bold pragmatism. In the end, I don’t believe we have the luxury to lose. *Italicized portions taken from tweets/notes made during the Ejeris Dixon keynote speech, and therefore are attributable to the wonderfully eloquent and visionary Ejeris Dixon! Personal reflections are from Eva Nagao, WCG member.